After a summer of exciting field research, I am back in Edmonton now at my home institution, the University of Alberta, for some exciting lab research. Being in Alberta is great, don’t get me wrong–I just went to the Rockies this past weekend!–but it makes experiencing ocean life quite a bit more difficult when doing it from a landlocked province. I spend my time in Edmonton processing samples I collect during the field season and by reading the primary literature to interpret the data I collected and formulate new hypotheses. I do miss getting to see marine life on a day-to-day basis, however, so I sustain myself by reading great marine blogs about ocean science (check out our links page to see some), reading scientific papers, and finding great videos of marine life online. Echinoderms: Sea Star Time-lapse: Eating Mussel from Shape of Life on Vimeo. Here is a sped-up version of giant spined sea stars, Pisaster gigantea, as they hunt for prey along a piling. This video was especially exciting because somehow, someone figured out how to put a tiny camera inside a mussel shell. Watch as the sea star expels its cardiac stomach (as opposed to the pyloric stomach–sea stars have two stomachs) into a gap in the shell of the mussel, digesting it right inside its own shell. Barbaric! And awesome. 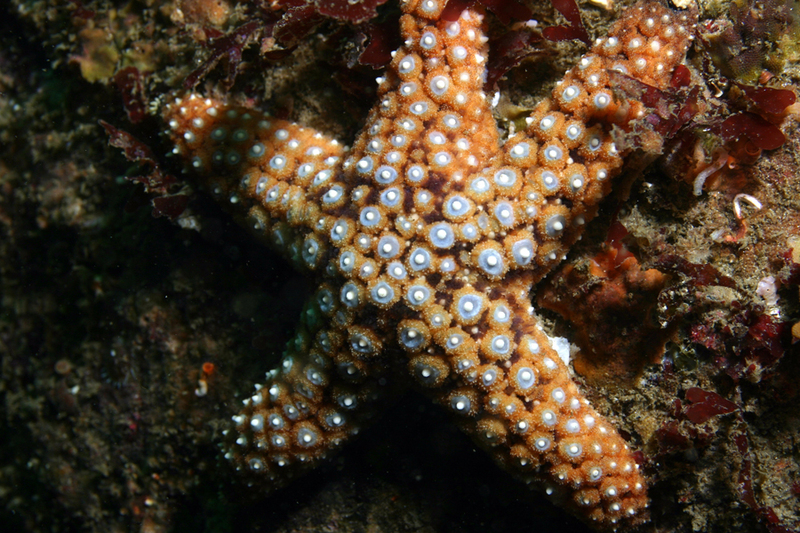 This species of sea star lives out in Barkley Sound and the Bamfield inlet. In fact, if you get involved in a Live Dive you’ll probably see some. 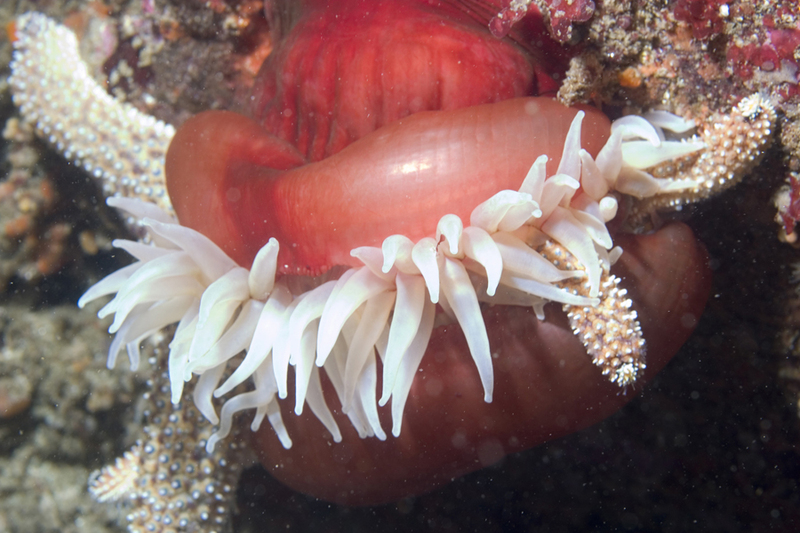 Live Dives are hosted by BMSC’s Public Education Program and are ways that land-locked folks, like students who live away from the coast, can still see what lives underwater. Scuba divers wear special masks with microphones and answer questions while diving the pilings beneath the docks of BMSC. While the approach of a sea star seems like an unstoppable march of tube feet, they aren’t immune to predators themselves. The sea star below didn’t notice the fish-eating anemone (Urticina piscivora) it was walking upon until it was too late. Any guesses about who ate this one? Here’s a hint: they like to hold onto their food with two paws, are known to control sea urchin populations from getting out of hand, and are locally extinct near Barkley Sound. Leave your idea in the comments section below! Who might have eaten this sea star? By the way, one of the cool things about sea stars: the one in the picture above is still alive! 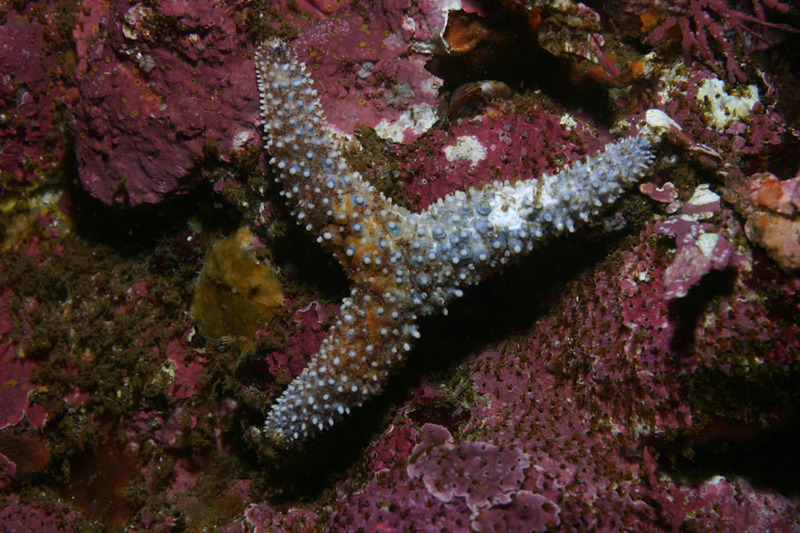 Even with two of its arms chewed away, it can still survive and will grow those arms back, as long as the central area of the sea star has not been damaged.